“Forbidden Future” Terra Harmony Talks Passion PLUS a Raffle! Writing with passion. Approaching the blank page. It’s all here. Short and sweet. 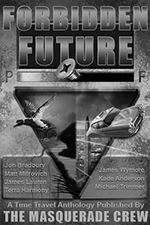 Plus a special extra look at “Forbidden Future” and its amazing authors. Enjoy this guest post by Terra Harmony of the “Akasha” Series!! !